when i started learning to bake a few years ago, i was intimidated. i’d heard many times how baking is more difficult than cooking, as it requires serious precision + has less room for improvisation. as someone who likes to uses lots of substitutions/adaptations + creativity in the kitchen, i found myself nervously measuring everything precisely, afraid to ruin the delicate science of baked goods. now that i have more baking experience, i’m happy to report that while, yes, baking does require some precision, there is still room for improvisation, substitutions + creativity. for example, i really wanted to make these muffins the other morning, but lacked 3 of the ingredients. rather than run to the store, i simply made some easy substitutions based on what i already had handy. and even without all the exact ingredients, they still turned out amazing! they’re rich, chocolaty + fudgy, + make for a decadent breakfast, a sweet afternoon pick-me-up, or a delicious after-dinner sweet. the moral? don’t be afraid to be just as creative + spontaneous while baking as you are when you cook – you may just create a beyond-delicious treat that you wouldn’t have discovered otherwise! preheat oven to 350°F. lightly grease a 12-cup muffin pan. in a large mixing bowl or a stand mixer beat together butter, cocoa powder, sugar, baking powder, salt + vanilla until fluffy. beat in eggs, then stir in milk + sour cream/yogurt. mix in flour, then fold in chocolate chips. divide batter equally between the muffin cups, they will be filled to the top. sprinkle each muffin with a little sugar if desired. bake for 23-28 minutes, or until a toothpick inserted in center comes out without crumbs on it – melted chocolate from the chips on it is okay. remove from oven, cool on wire racks 10 minutes, then remove from pan to wire racks + cool completely. I agree with you. There’s a popular wisdom that baking is very precise, and that creativity is best reserved for cooking. I do think it’s important to know the basics, and to understand what kind of substitutions you can and can’t make. But I’m not a precise person at all, and baking makes my heart sing! I love how tall these muffins are, and what a nice crunchy top they formed! True muffin perfection. I was just telling my kids that I felt like making some muffins today – these look perfect and the subs make it sound even better. 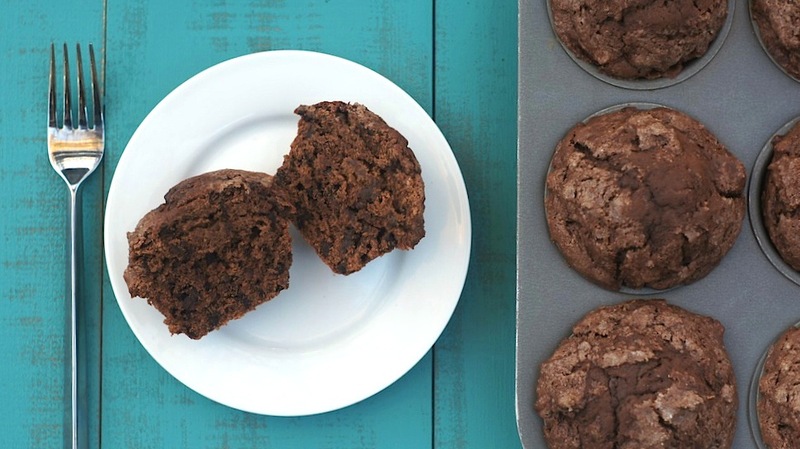 Ooh, these would definitely be kid-approved since they’re so chocolatey + decadent. =) Hope you + the kiddos love ’em if you try ’em! I love being spontaneous when baking, and I’m always changing things and making substitutions. These muffins look delisious. Gotta love double the chocolate. i can’t get over how perfectly these baked up! Love the chocolate milk sub–bet it made them even better! OMG, how adorable are the tops on these!! Love the chocolate milk substitution!! Yay, an inside shot! Thank you for that. I love seeing what the inside looks like. And nice job substituting! I would have never tried ricotta. I haven’t had a good chocolate muffin in years. Let me go for my run and then I’ll take half a pan! Whoa, Amy! You rocked these muffins!!! Those look like brownies disguised as breakfast. Brilliant! that is precisely what they are. in fact, last night my husband took one, heated it up, + topped it with caramel-swirled vanilla ice cream + chocolate sauce. after taking a bite, the first thing i said was, “this tastes just like a brownie sundae!” then i swooned + basically died of happiness. great job substituting! i think it’s also important to be willing to just TRY something…you never know if it’ll be good or not til you do…and it’s also a good idea to not make too many substitutions. i’ve had some flops that probably could have been avoided had i listened to my own advice. these muffins look incredible! I love that you subbed chocolate milk for the plain – so, so awesome. I’m always looking for an excuse to eat chocolate for breakfast, I need to make these soon! These turned out amazing! And I love eating chocolate for breakfast. I don’t know why this part is so funny to me but I am totally laughing that you had chocolate milk but not white milk…and good reminder to be creative and work with what you have in the kitchen!! we almost always have chocolate milk in the house, but very rarely white milk (unless I have a recipe that i need it for) – so random, I know!! To be honest, I am always pretty loosey goosey when it comes to following directions on recipes. Sometimes it turns out great and other times not so much. These muffins look like a resounding success though! I love the chocolate milk substitution. I’m totally in love with the fact that you used chocolate milk in these – genius! 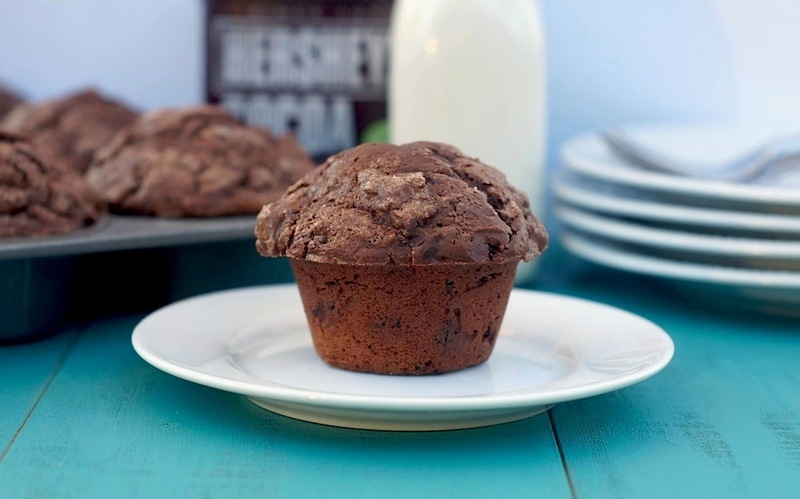 These muffins look divine – so moist and chocolaty in the middle. Yum! Oh Amy this was a great experiment in the kitchen! Wish I could reach in and grab one for breakfast! I am sipping my morning cup of coffee as I type this, I really wish I could grab one of these muffins. They look incredible! These look great! I love the big muffin tops. I always seem to end up with flat muffins sadly. That’s good to know that ricotta is a good substitute for sour cream in a baked good – I never would’ve even thought to try that! That was me! And see, Lesley Eats said that they looked like brownies disguised for breakfast. How else would she know that unless you posted an inside shot?! Yes. Inside shots are important. I completely agree. People always wonder how I can “invent” so many baked goods recipes because baking is such a science. It is, but there is a lot of room to experiment and be creative. These are perfect with a big gigantic mocha. I had the same apprehensions about baking and still kind of avoid it as I always feel there is too much of time commitment (but once things are in the oven? relax and wait with a glass of wine? what beats that?! )…but muffins/breads are definitely my favorite thing to bake. Not too sweet or too rich–just right! YES! all of the backdrops you’ll see on here are DIY painted wooden backdrops. i used this post as inspiration + just went from there! i made 4 different ones to start + i really want to make more in different woods/colors. you’re going to love the result when you make ’em! I’ve had enough fails where I’m not scared! My favorite muffins They came out great!! I actually love the creativity and freedom of baking along with the need for some precision…a perfect mix for relaxation in my books These muffins look perfect, I love the texture of that top! When I first started baking, I was just like you! I seriously did exactly as the recipe told me and never made any substitutions. 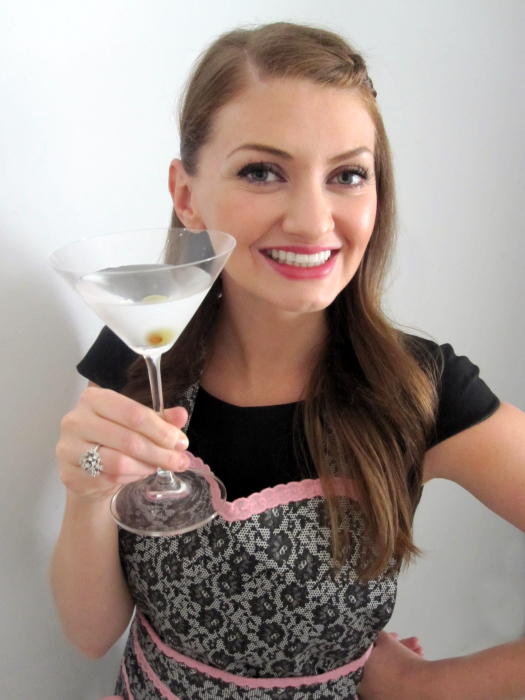 But now, I get such a kick out of playing around with the recipes and making my own adaptations! Love these muffins btw. You know I could always go for chocolate in the morning! One of these with my coffee would be perfect right about now! Love how beautifully they baked! I love how huge those muffin tops are…I want to tear it of for taste at that is the best part! I love that used chocolate milk. I would have never thought of that! Ooooh girl! your muffins look amazing! I’ll definitely be trying this recipe along with all the others! I just finished making these in mini-muffin form and they are to-die-for! They will definitely be going into my breakfast food rotation. That is awesome to hear, Jocelyn – so glad you liked them!